This has actually happened to me as a player, and a player I've DM'ed in a oneshot. In short, when we delve into a dungeon, whenever a DM describes an object in a weird way, we become very cautious to approach the said object. This is very true with objects that usually can be an animated object. The most common response will be "I shoot the [object] with my crossbow/fire bolt", or "I cast detect magic". Less common will be going into melee and smashing it. While this usually results in laughter when the objects are actually not a monster, this usually slows down the exploration. Describing that they found nothing special about these objects. First solution usually exacerbates the problem by limiting my ability to describe how the room looks like, and simultaneously highlighting important objects. For example, you automatically try to search the wall for a hidden switch for a secret room or passage because I told you "there is part of the wall that is less dusty", or automatically start buffing and attacking the pair of gargoyle statues because now I describe them, and they must be important. Second solution is related to first solution, because I can't say the found nothing special with these objects, if they are indeed holding important clues, and of course I don't want to give it away or hiding that they are important. The problem is this kind of approach slows down the game, and restrict how I as a DM describe environment - can only describe important things, but I want to immerse them too with relevant details. This also gives them essentially free turn before the combat. 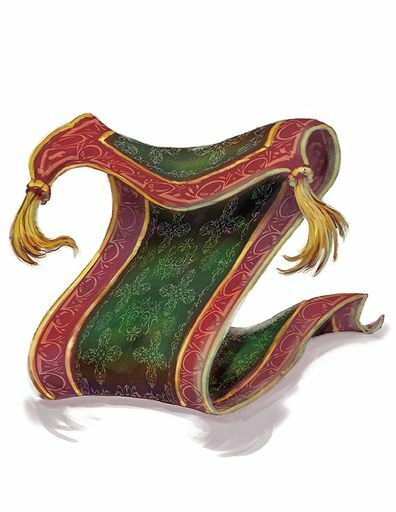 As a DM, how can I deal with their constant suspicions with random objects? I try to add a mundane description to every scene. If your "odd" descriptions are normal for your scenes, then they won't be suspicious. You leave the forest, slightly the worse for wear, but alive. An old tree catches your eye; its bark vaguely resembles a wizened face. The old tavern matches the description given to you by the beggar. Your eyes take a moment to adjust from the bright sunlight to the dim interior; the nearest table still has the remnants of the previous customer's meal. You make your way to the room you paid for. A banded chest sits in the corner; the metal straps seem oddly clean. Just to state some examples. It's about a greater overall effort to be more descriptive. The point being that if you describe the scene adequately all the time (or at least often), then "a chest sits in the corner" won't be as weird or suspicious. It's important to note that this is in conjunction with not overusing hidden enemies. No amount of normalizing descriptions is going to abate suspicion if every other room has a mimic. 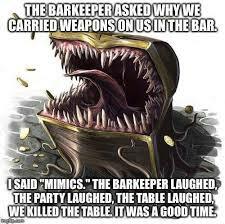 Mimics are an iconic monster/trap in D&D, and have been for about four decades. There are a variety of memes and jokes associated with them, including this one. and proceed with the narration. Keep your own focus; that's a thing that you can do. As a DM, rarely use them, or never use them, if you find their existence in the game world to be a problem. You never have to have one in your game. They aren't a required monster in your game world. If you do use one, place it with care. Make its location and existence fit the scenario that you have created. Mimics survive because they surprise things and eat them. You can't stop players from some meta gaming. As the memes, and jokes, that your players have access to spread via word of mouth, reading the books, or at various internet sources, you'll only frustrate yourself if you try to control that. Save yourself the effort. The same is true for lurker's above, animated armor, gargoyles, rugs of smothering, and various plants that come alive to eat the PCs. Hey, look, I found a magic carpet! Let's go flying! As the DM, you control the spread of lore in your world. This kind of "general" versus "specialized" knowledge would include a sense of 'how well known is the existence of mimics' (if it is known at all) in this campaign world? @TimothyAWiseman points out that if your world is one in which the existence of mimics is well known, then testing for them is (1) not metagaming, and (2) is a valid in-character action by any adventurer and should not be seen as an obstacle to play. Part of what causes mimic-phobia is the constant threat of things like animated armor, gargoyles, mimics, skeletons that animate from the floor, etc. I had a player that was constantly afraid of anything statue related, which is when I realized that the only time I ever describe statues is when they will animate and attack the players. The way I got around this was simple. I didn't use gargoyles for a long time. Eventually, he forgot gargoyles were a threat or didn't think I'd use them again, with the same result: he wasn't afraid of statues anymore. So for a while, don't use any monsters like this. There are plenty of other dungeon-crawling monsters to use, so the use of mimics, gargoyles, animated objects, ropers, etc. isn't necessary for every dungeon. Perhaps try a water-themed dungeon with sahuagin and myconids, or the lair of a large fire creature that has salamander and newt servants. Then, if you want them to start fearing the environment again, you can bring back the mimics and gargoyles. The common theme throughout these types of the questions is that the DM will generally only call out things that are important. So if the DM says, "there are statues flanking the stairs," that must be important. Your description should not be on just the things the players need to interact with, but with what their focus would be. Describe how a rug is placed oddly in the room, that the cabinet sits with one door swinging in the wind, and the paint is flaking off the north wall. All of this has nothing to do with the story; it's just flavor. "You open the door and see a rather chaotic room. Although the room is unlit, there is some light coming from the moon outside the only window not boarded up. The floor is mostly carpeted, except in the center where it looks worn away. There are upturned tables and chairs pushed to the walls, emphasizing the clearing in the center of the room. Sitting in the center of the room is a large, wooden table, very different design than all the other furniture in the room. The light from the moon almost seems to spotlight the table. It has no chairs near it, nor any objects upon its surface. What do you do?" Turns out the table is completely normal and was brought in there on purpose by thieves. They placed it there to make it very suspicious so that adventures would waste time and spells. However all the thieves are hiding behind the tables pushed against the wall (less likely to be hit by Area of Effect spells), and a couple that hide behind the now open door. When a few adventures do finally enter, they slam the doors shut, and lock the doors separating the party. Note how the description is keyed to the focus of the room. When the players enter the room, highlight what is obvious, and downplay the rest (mundane and threat alike). In my example, if you walked into a room with a single table, bathed in moonlight, with no furniture, not even the carpet within 10' of it, that is where the their perception will focus. I didn't NOT talk about the tables the thieves were hiding behind, but wouldn't be the perceived danger. The key is to change up how you describe rooms. Drawing attention whatever is the focus of the room, and down play everything else. "As you enter the ballroom, you are overwhelmed by the immense size. This grand room could fit the house you grew up in. Streamers litter the floor in a paper spiderweb. The chandeliers reflect the light from your torches across everything. The twinkling lights make it hard to focus. You can see a few dusty suits of armor to the south and north. There is a bar in the back where you can only imagine once held a buffet. Between the streamers, you can make out the tile floor a checkerboard of black and a light green; matching the drapes that cover the most of the walls. In the center you can make out what could be a dead body, partially covered by streamers." Can you guess the threat? It was the imps hanging in the chandeliers. If you want a party who is not paranoid, in spite of being repeatedly attacked by mimics, the only way to get it is to metagame, in cooperation with the players. Many of the answers here consist of variations on "don't use mimics" or "don't ambush your players with mimics. What if you want to be able to use mimics, but at the same time have your PCs not be paranoid about them all the time? Well, that's going to take some metagaming. After all, if you say you want your players to be surprised the twelfth time you hit them with a suit of animated armor, you're basically saying that you want the emotional and social payoff of consistently outsmarting your friends without actually having to put in the work to come up with anything novel. That's both mean and somewhat lazy. On the other hand, maybe what you really want isn't to constantly count coup over your friends at the table, but instead just to have the experience of a moderately foolish party who is constantly getting surprised by mimics because it makes for an interesting tactical experience. That is the sort of thing you can talk out with the party, and potentially get them to agree to, especially if you're willing to promise that the mimic-style encounters will have some other benefit. Perhaps you lard a bit more treasure into them, or you make them a bit under-leveled or something. You'd essentially be giving all of your PCs the flaw "insufficiently paranoid about mimics", and then rewarding them when they RP it properly. That could actually be a pretty entertaining game, especially if everyone was okay with playing it up a bit for humor value. If things get bad enough and nothing in-game will solve their paranoia, you can just flat out, as a DM, tell your players that there are not any mimics in this room or dungeon. Of course, your players may think that you are trying to lower their guard so that you can surprise them with a mimic in the next dungeon. In that case, you may have to take the nuclear option and just tell your players that no more mimics will appear for the rest of your campaign, and their characters should stop expecting them. If they look for mimics, tell them out-of-game that you are still holding to this. Eventually, they will learn and you can get back to your game. If you did want to reintroduce mimics after banning them, give them plenty of warning, either in-game (this sorcerer is known to keep one of the last mimics known to man) or out-of-game (hey guys, I'm temporarily suspending the no-mimics rule and have placed two mimics somewhere in this dungeon). But of course, that might reintroduce the problematic behavior again. Give them a simple way to detect creatures disguised as objects. Give one of the characters a dagger that hums when drawn if mimics, gargoyles, animated objects or other creatures disguised as seemingly-innocuous objects are near and in plain sight. I name this weapon Stone-Like. "The roof is lined with grotesque statuary, which--"
"Four suits of full plate stand upright in the corner." You attack the chest and you break items inside. They blast the armor and it triggers a trap when they weren't ready for the trap. The stone statues were inert but the arrow shoot knocked them off the roof- duck for cover. You destroy the valuable painting. This will help tone down the mimic-phobia: shooting everything endangers them, loses money and items. Assess wandering monster checks strictly; either according to some fixed-real time schedule, or every time PCs start attacking in this manner, etc. Systemically have spell-like abilities (fire bolt, detect magic... even track crossbow bolts) strictly limited by gaming session. Not the answer you're looking for? Browse other questions tagged dnd-5e gm-techniques objects mimic or ask your own question. How can lycanthropy be cured? How can indefinite madness be cured? Could a Mimic mimic a Simulacrum? Does the appearance of a mimic change in reaction to being enlarged/reduced? At what level can a party fight a mimic? Can a Mimic (container form) actually hold loot?